Pick-up daily in Waikiki from 8:00AM on air-conditioned Royal Star vehicle. 100% seat belted fleet with on board restroom and original in-depth video. Arizona Memorial with pre-reserved ticket. Newly renovated visitor center. U.S.S. Missouri (optional) has Mighty Mo pass included. Enjoy famous WWII battleship, Missouri for 2 hours at your leisure. View surrender deck where WWII ended. Visit Punchbowl National Cemetery and Downtown Honolulu. 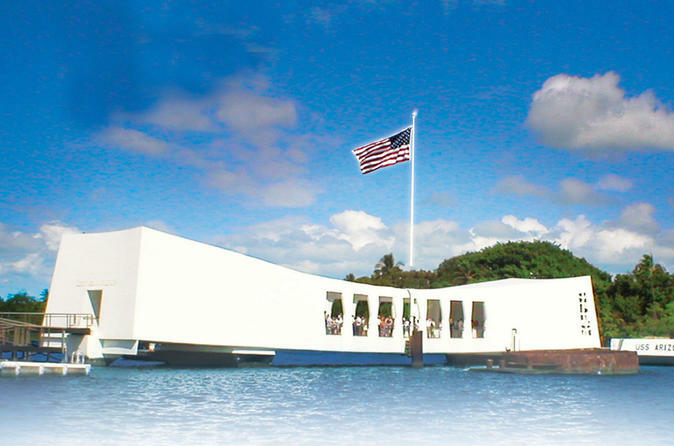 Driver narration and original onboard video will elaborate on the U.S. military in Hawaii, information about Punchbowl, and life in Hawaii during World War II and at present, highlighting the state capitol building, lolani Palace, Chinatown, and more. Drop off to Waikiki around 1:00 P.M. for Arizona Tour and 3:00 P.M. for Arizona & Missouri Combo Tour.